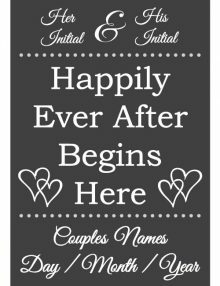 Attach your wedding road signs to this 3ft wooden stake and place them along the road. SKU: 54. Category: Miscellaneous. Tag: wedding. Screw your sign onto the wooden stake and place it in the ground. Make your big day unique with our personalised wedding number plates! 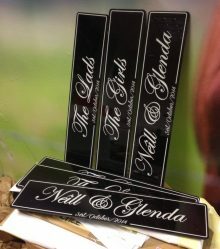 Our Wedding Plates are made from a rigid acrylic plastic & backed with a vinyl the same as your standard NCT Car plates. Standard size is 20.5” w x 4.4” h. The plates are waterproof. NOTE: It is €18 for one single plate, so if you want a set of two plates, one plate for the front and one plate for the back of the wedding car increase the quantity to 2. NOTE: It is £18 for one single plate, so if you want a set of two for the front and back of the wedding car increase the quantity to 2. If this sign or poster does not match your colour theme just state what colours you would like in the box below and our designer will change the sign or poster to suit your needs. Our Paper Posters are made using heavy duty poster paper perfect for framing, this can be placed on a table or tripod stand. Our PVC signs are made using a strong light weight plastic material. They can be placed on a tripod in the church or alternatively a ribbon can be attached and the sign can be hung up. 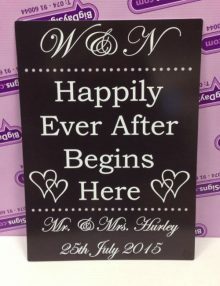 NOTE: It is €18 for one single plate, so if you want a set of two for the front and back of the wedding car increase the quantity to 2. Our aim is to help you make your Big Days, special, more fun, memorably by putting your stamp on them. Follow us on social media on the top of this page to keep up to date with our favourite projects, competitions & giveaways.